A few interestingly shaped and colorful storage solutions. oday everyone needs a constant access to their personal data anywhere, anytime. 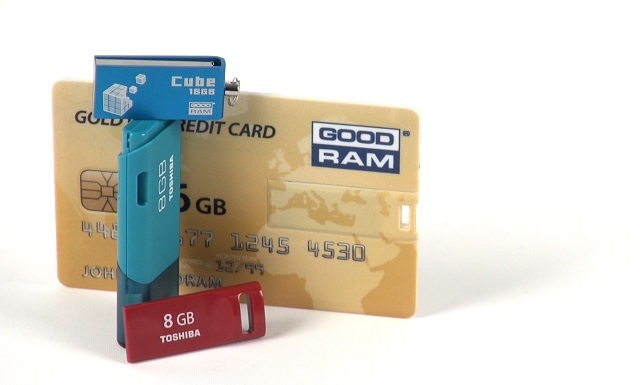 What a better choice for info storage than a compact USB flash drive that fits in your small pocket? Today we have for you a few interestingly shaped and colorful storage solutions. Good RAM has attached this 16GB USB v2.0 flash drive to this credit card model just to show you how compact and thin it is. You have so much storage in such tiny dimensions. In the 16 GB version they can hold up to 4000 songs which equals around 280 hours of music play. It doesn’t require any drivers in order to use it on your Windows 2000/XP/Vistaor Windows 7. The flash drive is also USB v1.1 compatible. The second USB flash drive I am going to show you by Good RAM also stores 16 GB of content but besides providing a huge storage for your information it also plays the role of an effective key holder. The other two are manufactured by Toshiba and store 8GB of storage. The red one is exceptionally slim and small looks small even in my tiny hands. It can also be attached to your keys so that all the important files are always with you The other one is a blue flash drive with a cap, it is a typical-sized USB flash drive with 8GB of storage Both of them transfer content at the speed of 1MB/s and are compatible with all versions of Windows and Mac platforms as well.